Happy 5th Birthday, Katy Grace!! 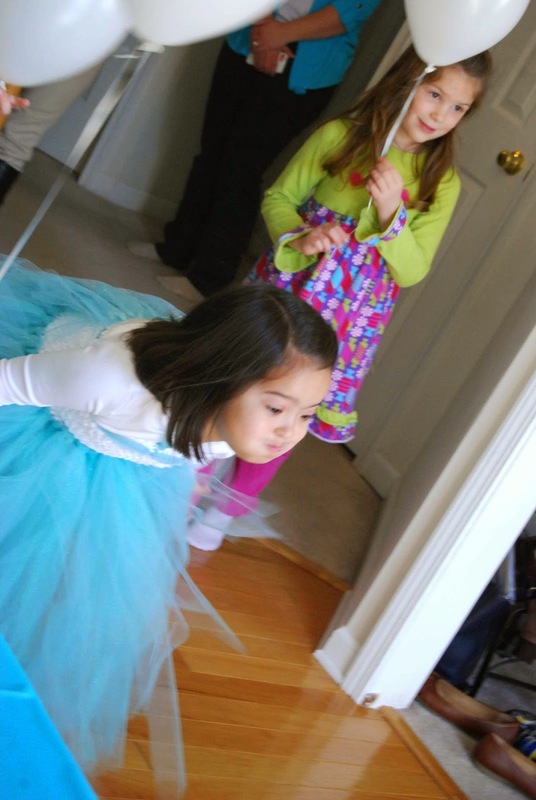 Wordless Wednesday- "I'm So Fancy!" 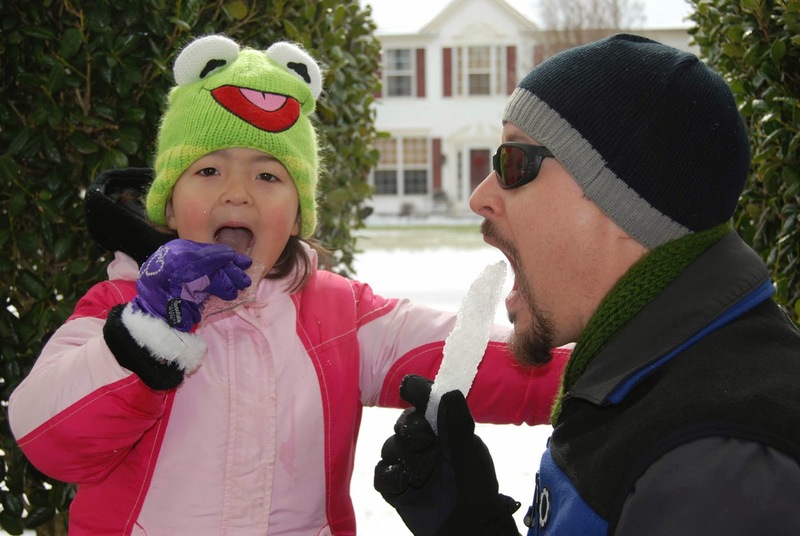 We experienced some rare North Carolina "snow," this week! 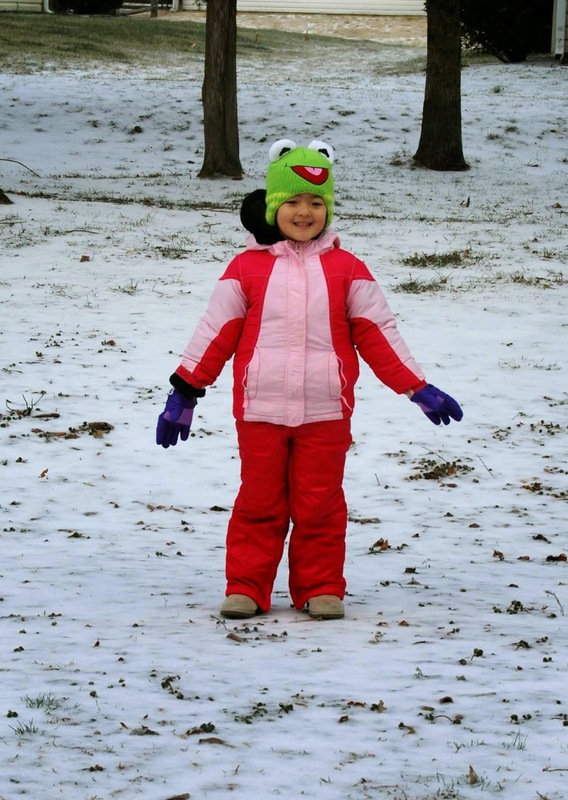 Of course, Katy wanted to go out and play! 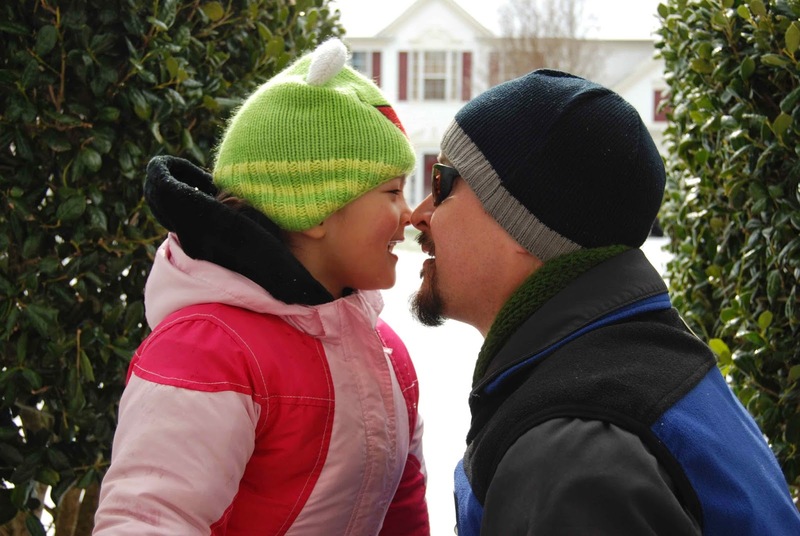 Twenty layers later and Lil' Miss was out running around, playing and eating ice with Daddy. "Ugga Mugga!" We love SNOW!! 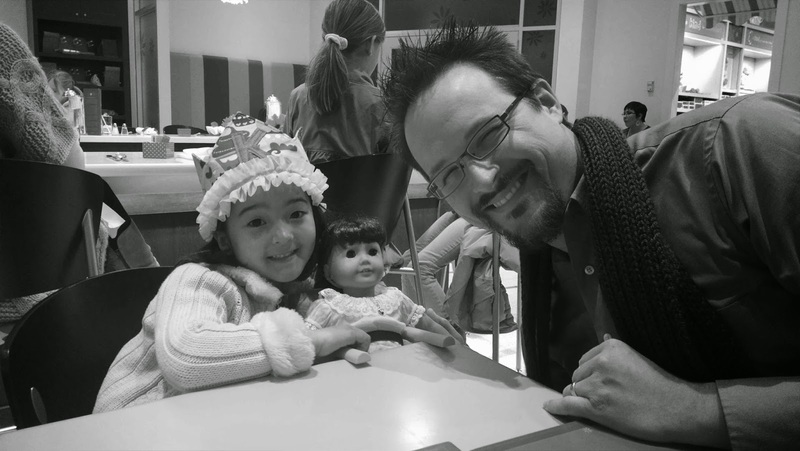 For some time now, Lil' Miss has wanted an American Girl Doll to call her own. Since it really wasn't in the everyday budget, we told her that she'd have to work hard at saving up her money to buy one on her own. 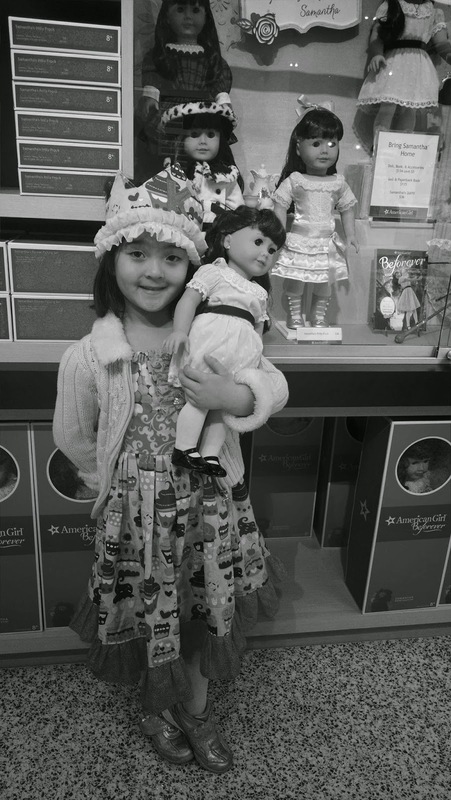 Well, almost one year later, many, many quarters later (she gets a quarter for every chore that she does), and after tithing the first 10% to church, Katy finally got her doll!! 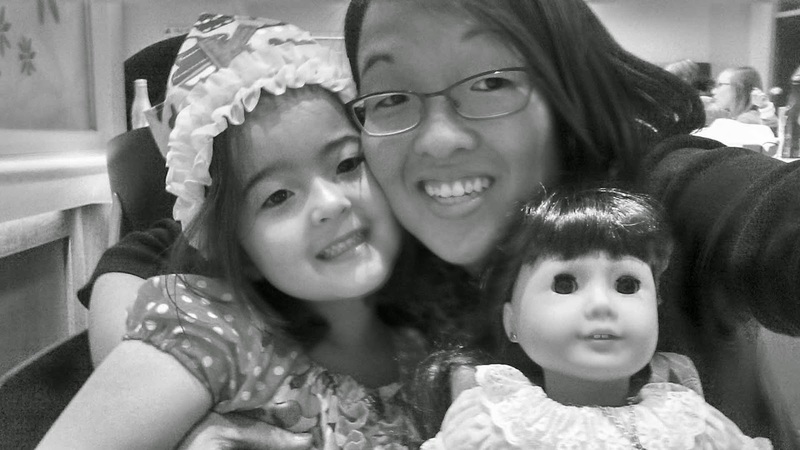 Samantha is the first American Girl book that we read together. 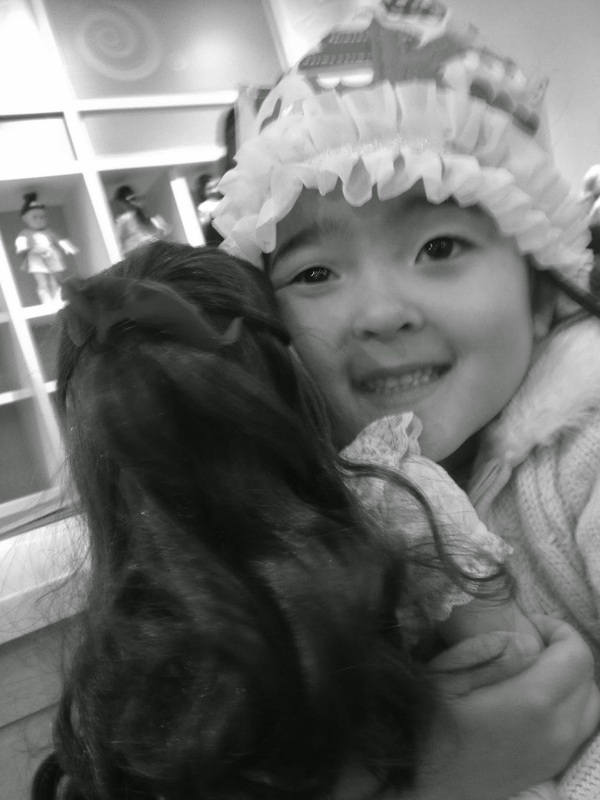 Kudos to Daddy for coming along for the doll selection. 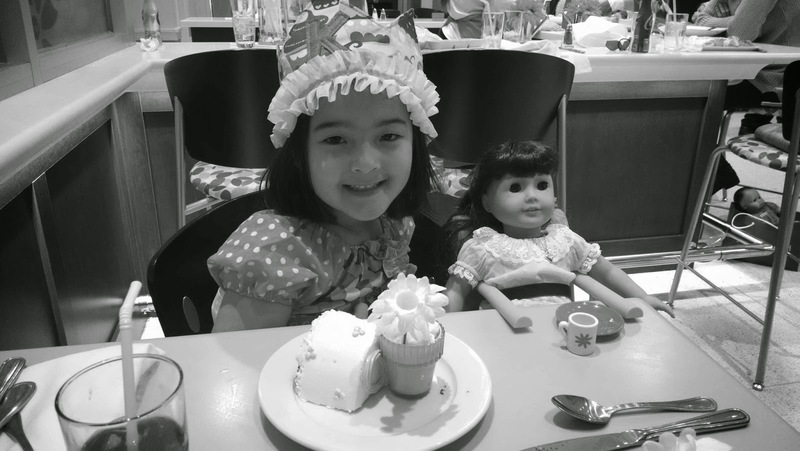 While we were enjoying a special birthday lunch at the American Girl Store Bistro, Katy informed us that our meal was Samantha's first. When I asked her to elaborate, she told us, "....that it's like when you came over on an airplane as a little girl, Mommy. Samantha used to live at the store and she didn't have a home. And now, I picked her and she's coming home to live with us!" Talk about little ears listening to every detail! We are so PROUD of you for learning a valuable life lesson- how to save your money and how to work hard to earn what you want! Good job! 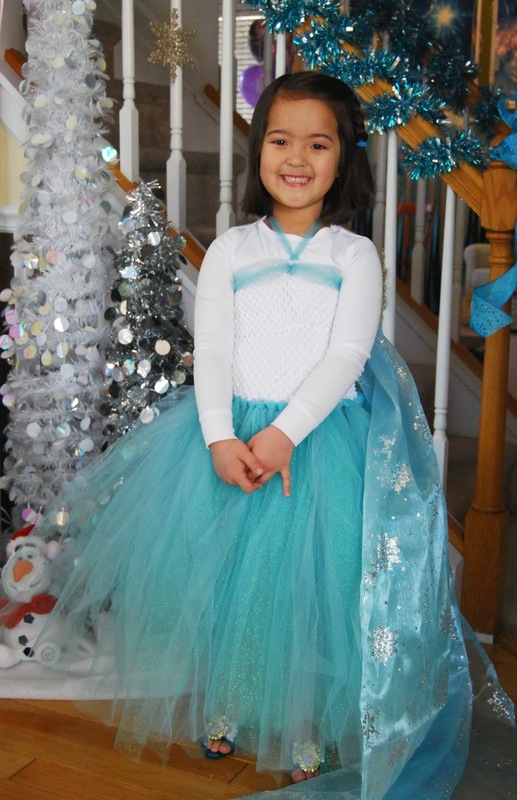 We showed our #DisneySide by dressing up for the event! Katy was dressed in 200 yards of glitter tulle and a long, sparkly, snowflake cape. 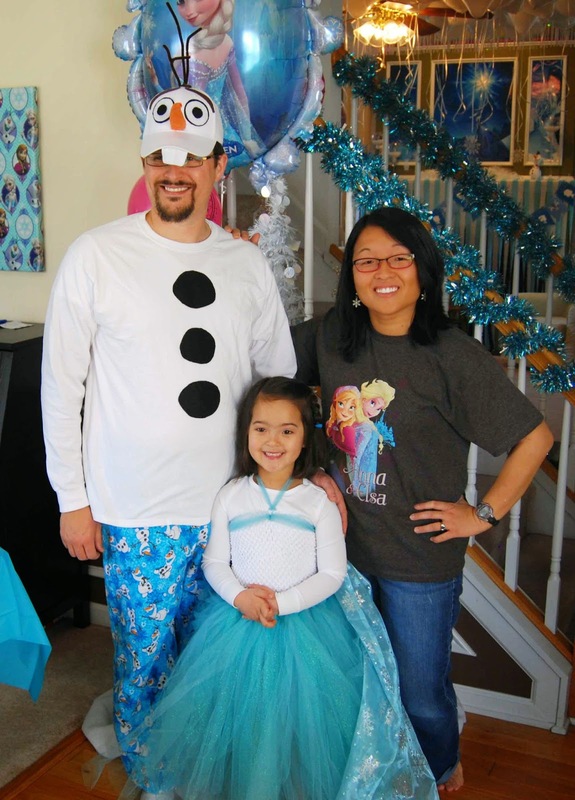 Daddy donned his Olaf costume for the occasion. 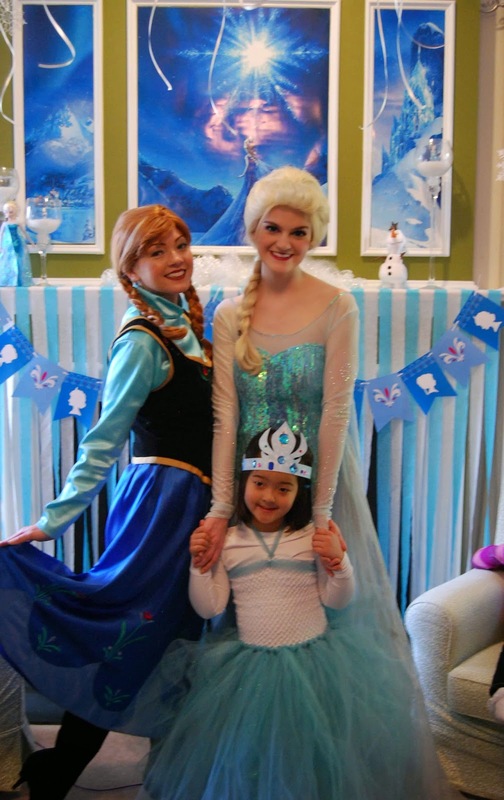 Lil' Miss was more than a little surprised to see "Elsa" and "Anna" at her party! 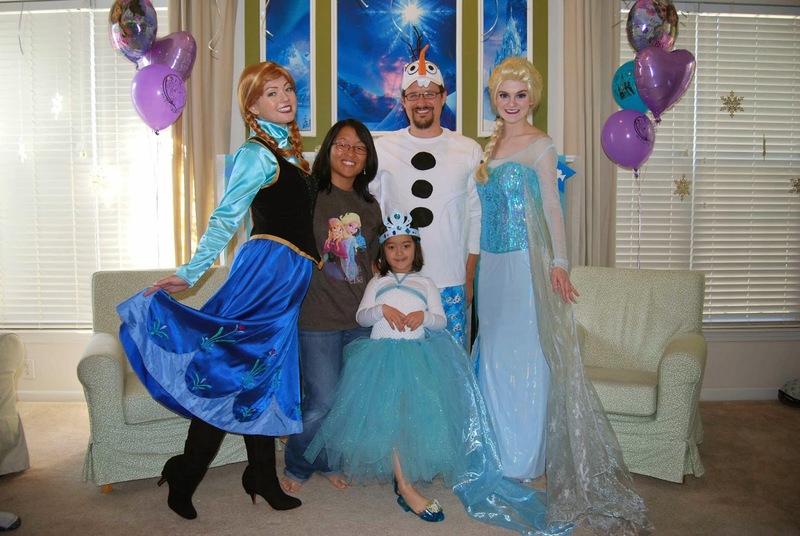 Thank you, Enchanted Elegance for making our daughter's birthday party memorable!! 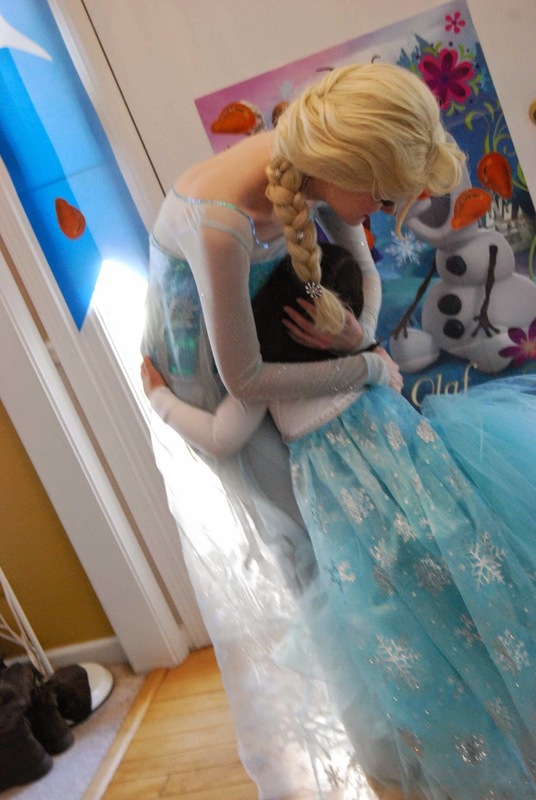 These talented princesses were kind, elegant and punctual. 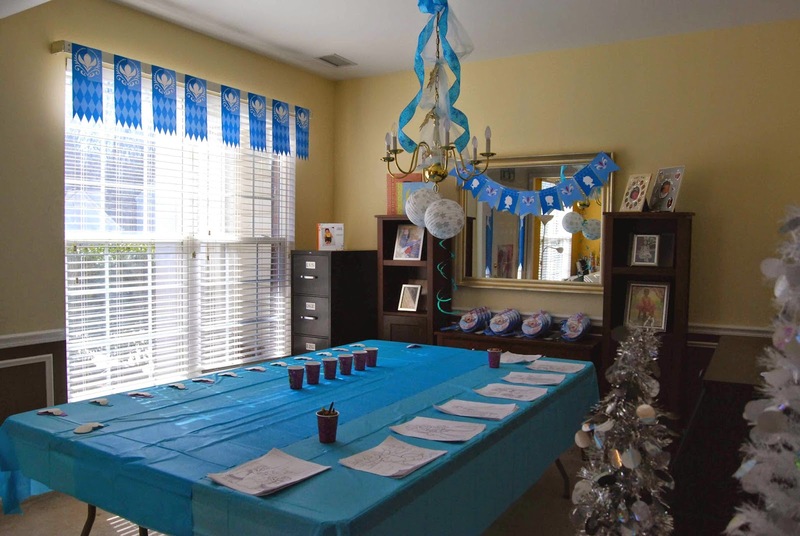 They kept the complete attention of almost 20 children for a full hour! Now, that IS magical!! 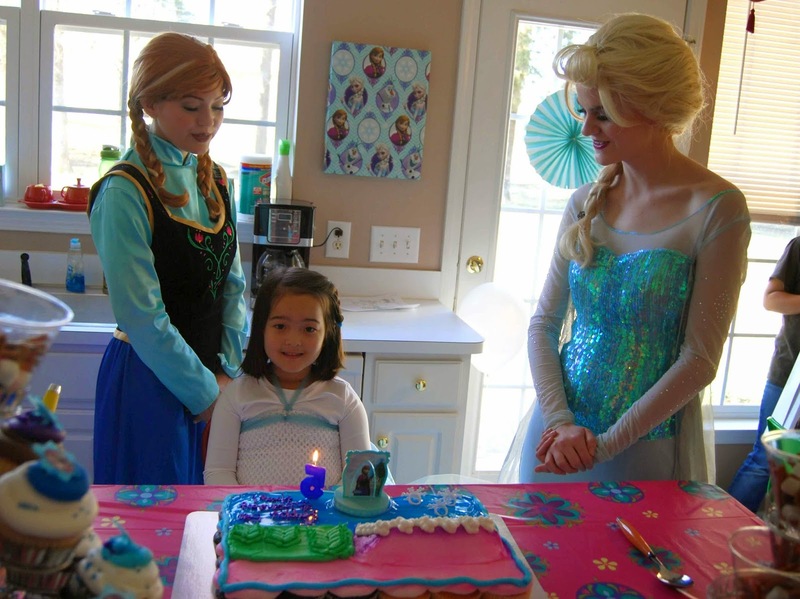 Elsa and Anna helped sing "Happy Birthday!" to Katy. 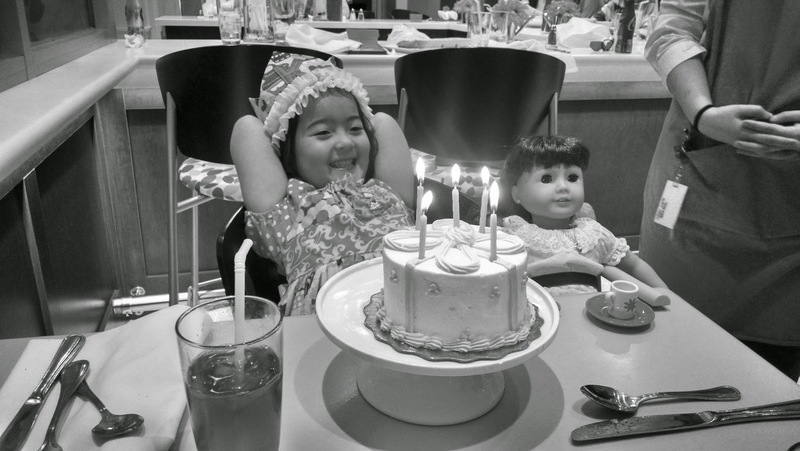 Happy 5th Birthday, Katy Grace!!! Happy, Happy, HAPPY Birthday to our sweet Katy Grace!! 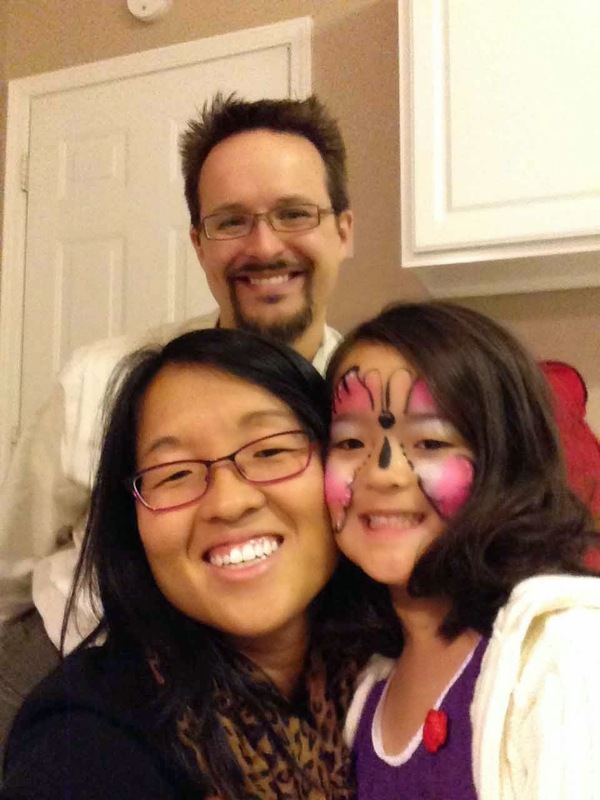 With her birth, she made us parents and completed our little family. These past five years have just FLOWN by!! Every day is an adventure with Lil' Miss and I'm so glad to be on this journey with her. Katy enriches our lives beyond measure and I truly cannot imagine life without her laughter, her imagination and her unending supply of questions. She pushes me to be better because she is always pushing the limits- in good ways and trying ways. She has such a capacity to love and be loved- I love watching the world through her eyes. She makes us smile, she makes us laugh and yes, sometimes cry. Everyday there is some funny anecdote or saying that she says that makes us wonder, laugh and scratch our heads. Just the other day, she came up with this thing where she'll shaker her hips in a circle when you say "hot chili sauce." Hilarious! Seriously- I'm still laughing! Daily, she is learning and processing and taking in this great big world. The world is her stage and she isn't shy about taking it by the horns! She has a zest for life that I pray she never looses. With every task that she sets her mind to, she sets out to accomplish and conquer. I am so proud of the way that she sets goals and does her best to reach them. Take for example, her recent determination to learn to ride her bike without training wheels- one week- that's all it took her, once she set her mind to it! 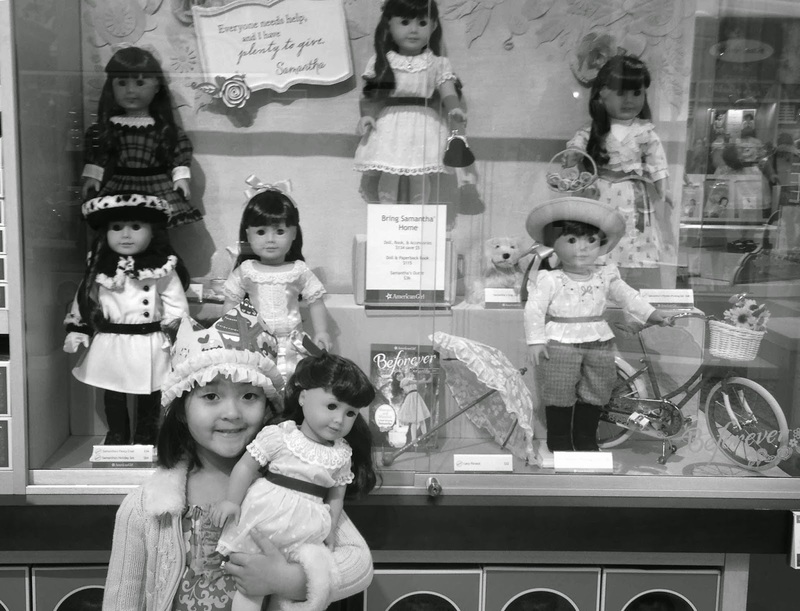 Or, her desire to save up enough money to to buy her own American Girl Doll. One year later and umpteen many quarters later (she gets a quarter for each chore that she helps with around the house) and Lil' Miss proudly picked out first doll, today. Amazing! 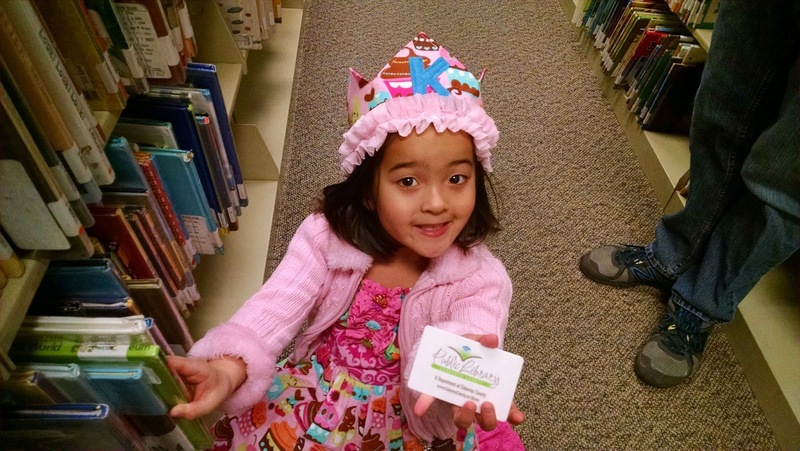 Favorite Books- She still enjoys Berenstain Bears, but we're into American Girl books, too. Favorite Color- She's still really into Red and Pink. Favorite Food- Chocolate, chips and salsa, pepperoni, cheese and crackers. And, let's not forget onions. Lots and lots of onions. 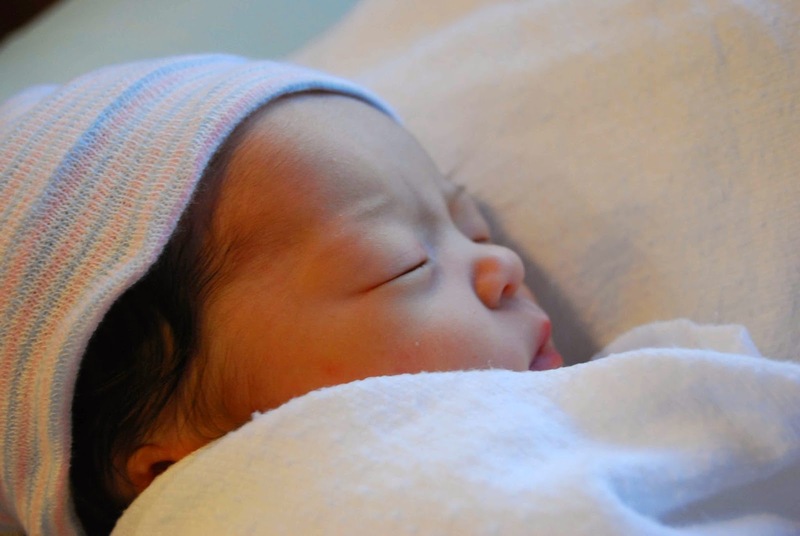 Height/Weights- Height- 43.5" (70th Percentile). Weight- 48 lbs (88th Percentile). Current Clothing/Shoe Size- Size 5t clothing, size 11 1/2 shoes. She still LOVES to dress up fancy and prefers to wear dresses over pants. Currently on Her Nightstand- American Girls, Felicity and Wizard of Oz. It has been a great year and I can't wait to see what this next year has in store for Katy! Happy, Happy, Happy 5th Birthday, Katy Grace!! Daddy and I love you beyond measure- a million times a million!!!! Lil' Miss is the big FIVE, today!! 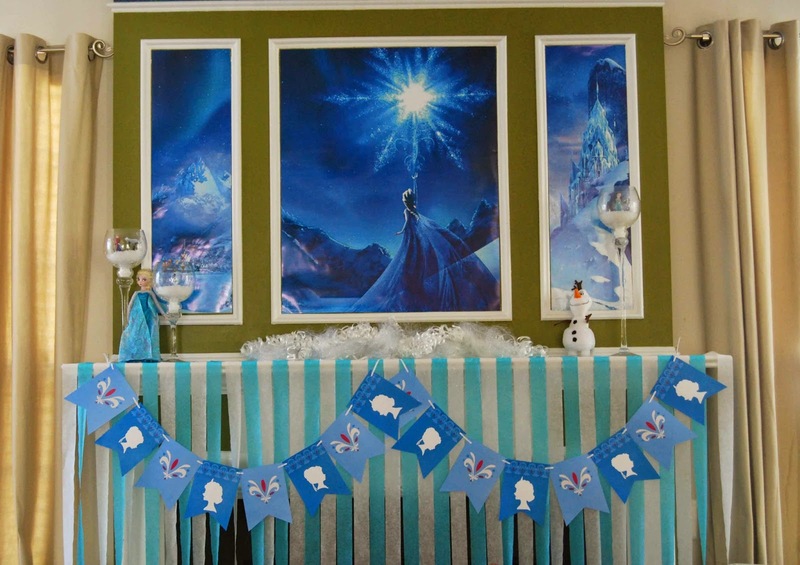 We definitely showed our #DisneySide @Home Celebrations by celebrating with a Frozen themed birthday party, this past weekend. 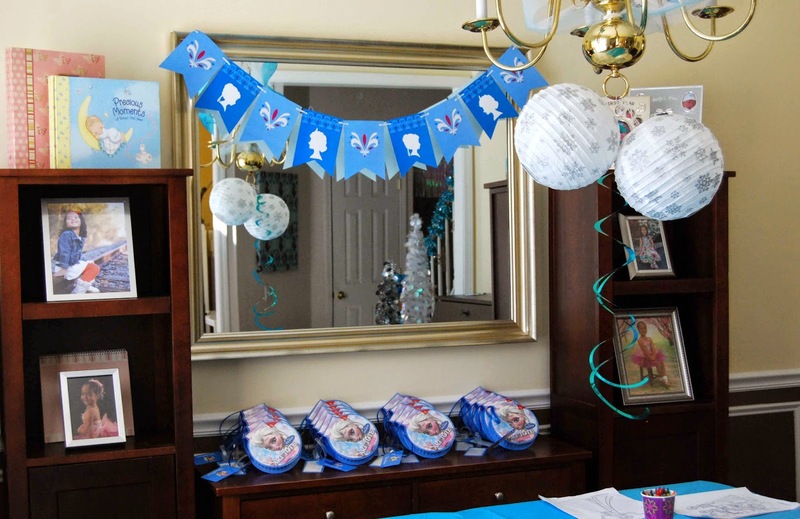 We had Elsa Art Totes as favors and lots of crafts to entertain the guests. 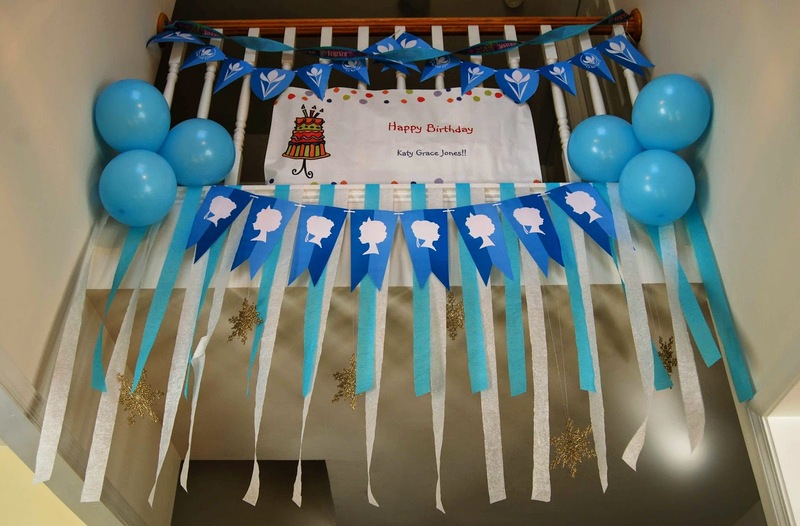 We had tissue paper pom-poms, snowflake lanterns and a large "Happy 5th Birthday" banner adorn the living room/Kitchen. 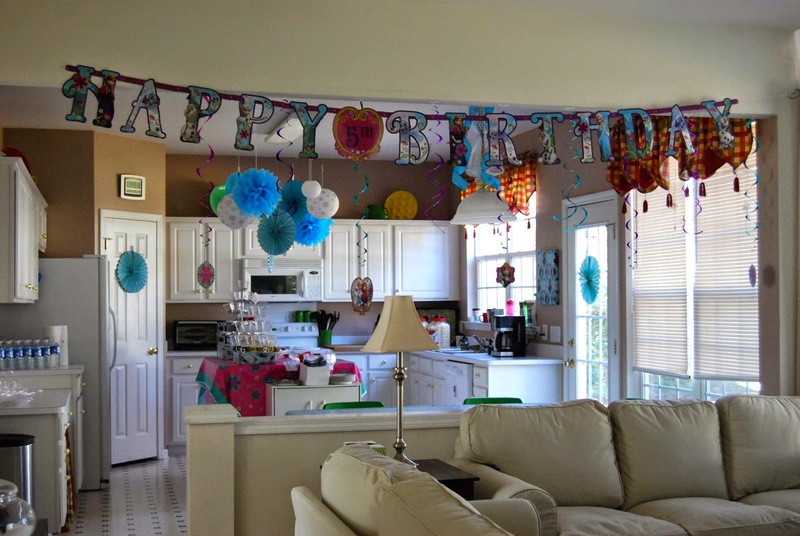 There were 72 white balloons hanging from the living room ceiling. 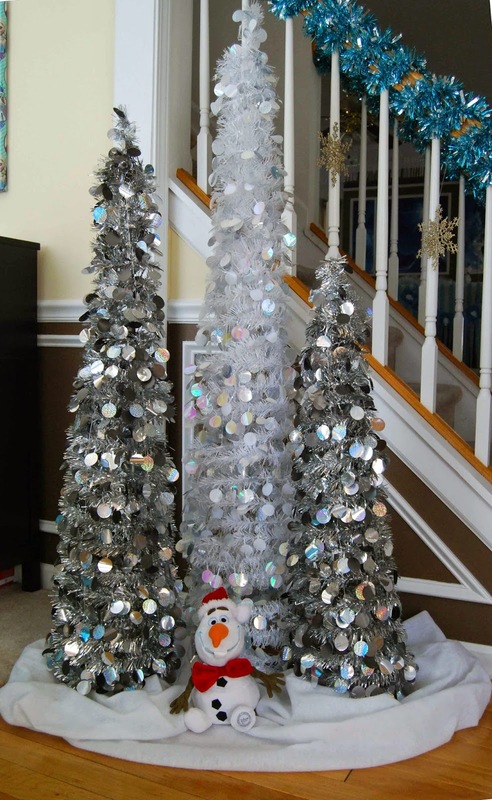 It looks "snowy" and "wintery." 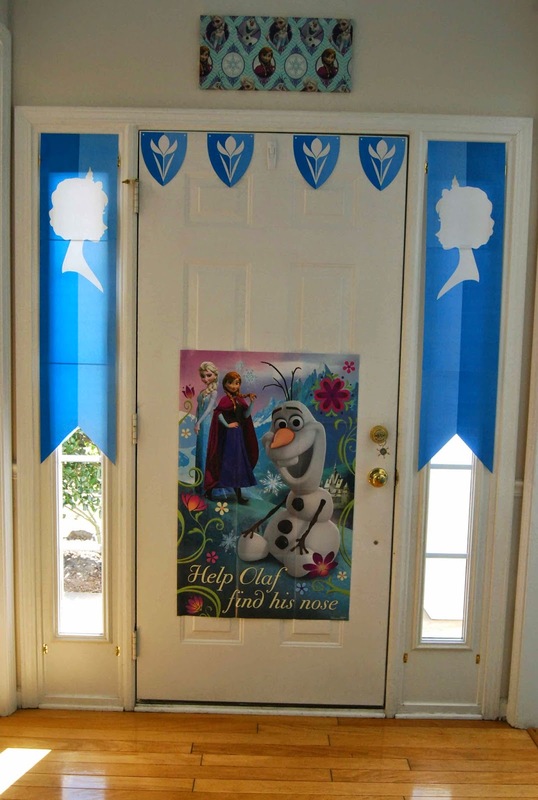 Ted created a magical, Frozen scene for the mouldings above the fireplace. I hid the "black hole" that is the fireplace with crepe paper streamers (don't worry- we shut off the pilot and gas before decorating!). It created the perfect backdrop for pictures. 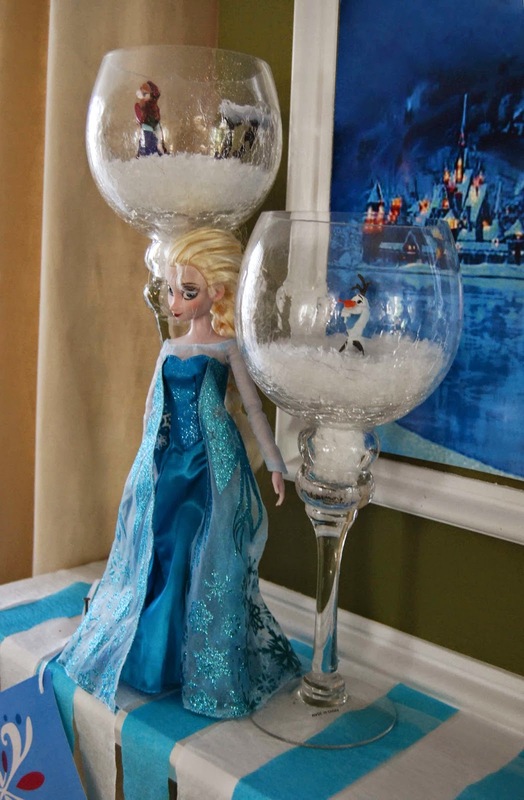 We used some of Katy's own toys to decorate and create the perfect Frozen setting. 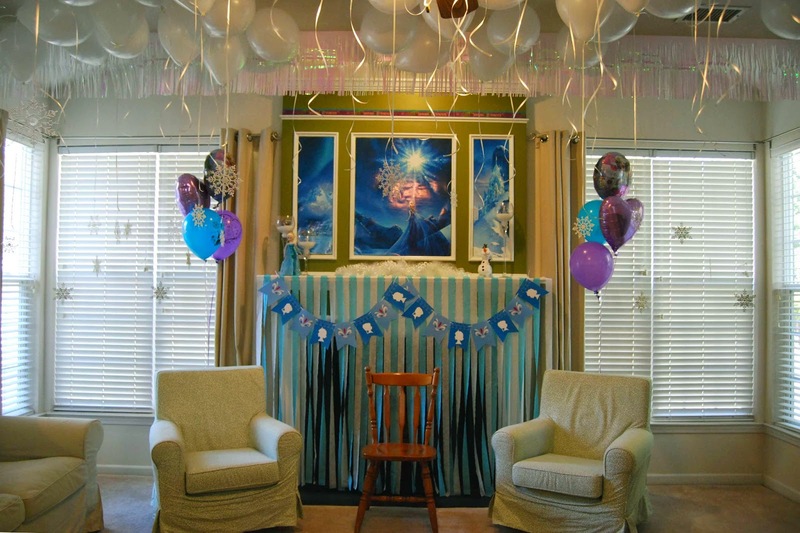 Happy Frozen 5th Birthday, Katy Grace!! So, the other night, Ted told Katy that she could read one book before she shut off the light and went to bed. 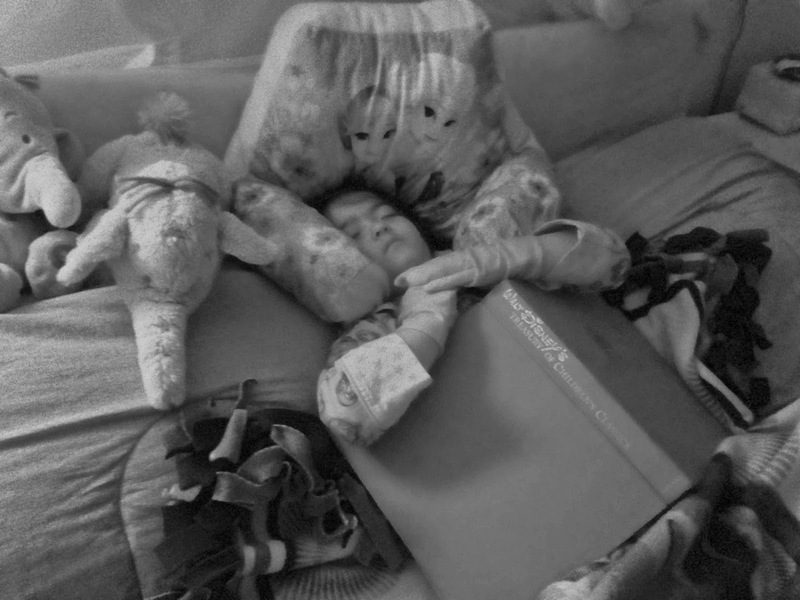 Well, hours later, when we went in to check on her (before we went to bed), we found her snuggled under her Kermit the Frog blanket and clutching a very LARGE, LONG tome, fast asleep. One book.... we didn't specify how long or big.... details, details.... way to work the system, Lil' Miss! "Spread Love, Not Germs! Happy Valentine's Day!" If you know me personally, you already know that I am a germ-a-phobe. As in; cousin of Monk, stockholder in Clorox, wash-in-wash-out. Couple this with the current flu/cough/cold/virus/whatever-else-is-floating-around..... AHHH! When I came across these adorable free Valentine's Day printables from Simply Sprouted, I knew that I just HAD to do it for Lil' Miss' Preschool Valentine's! I was lucky enough to find some fun, fruity-smelling hand sanitizer on clearance after Christmas- with an attachable clip, no less!! Break out the curly ribbon and 2" paper punch and- VOILA!- Valentine's Day 2015 is done! So, here's to a happy, HEALTHY Valentine's Day 2015! Cheers! Katy Learns to Ride a Bike (Without training wheels)!!! Katy learned to ride a bike! Without training wheels!! And, boy, is she FAST!!! Recently, one of Katy's friends learned to ride without training wheels and Lil' Miss got it in her head that she'd like to give it a go, too. We told her that once we took the training wheels off, we wouldn't put them back on. She would HAVE to learn or she wouldn't be able to ride her bike. Well, we took the wheels off last Saturday and less than a week later, she's yelling, "I got it, Mother!" And zooming off into the distance!! I'm so proud of her!!! 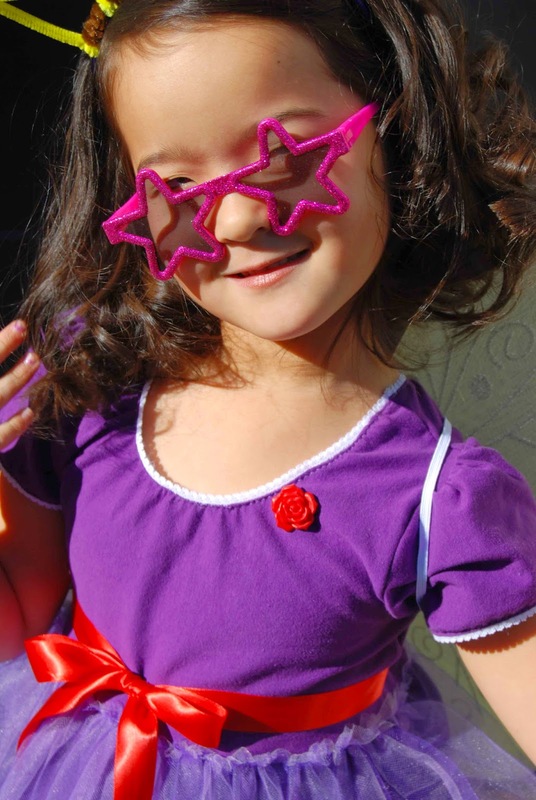 Look out, World, here comes Katy!! 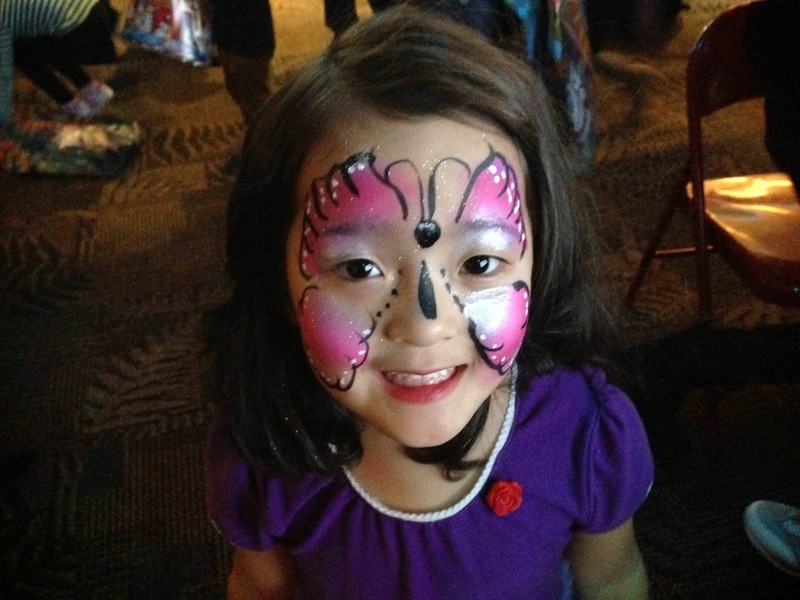 "When we went to the circus, last week, Daddy took some pictures with his phone. Here they are!" 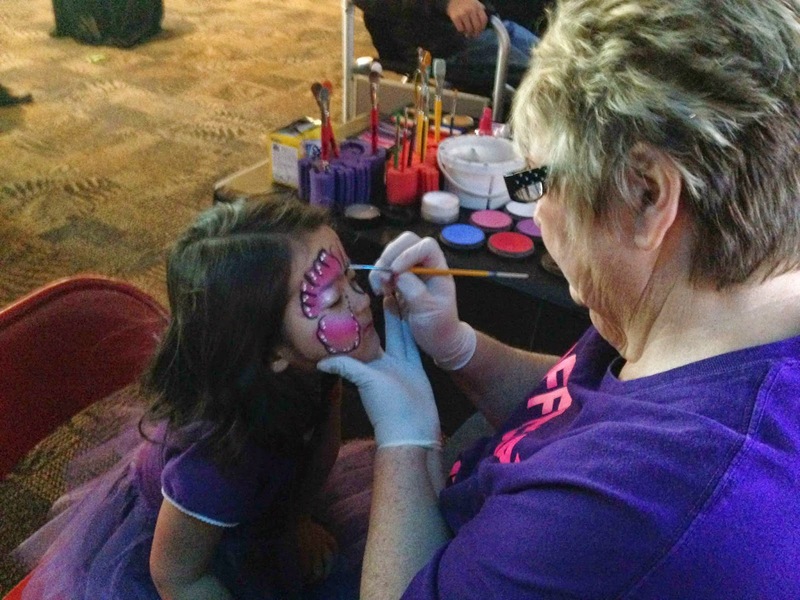 "I REALLY wanted to get my face painted! I sat nice and still for the lady." 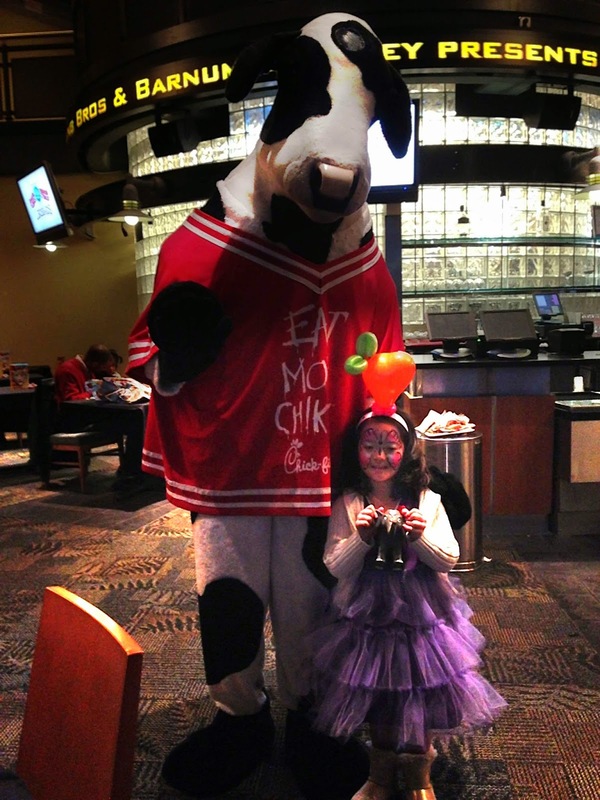 "Dinner was sponsored by Chick-Fil-A- obviously!"